By	Allyson Haymaker. Last edited by Marios Alexandrou on May 12, 2018. Ashfall Fossil Beds State Historical Park in northeast Nebraska contains the largest intact fossil bed ever discovered from that time period. It includes hundreds of perfectly preserved animal skeletons (see above) wrapped in a blanket of ash that's thought to be 10 million years old. Scientists believe the ash came from an Idaho volcano more than 700 miles away, falling up to a foot deep and drifting up to 8 feet deep. Paleontologists are having a field day, never sure what they'll find next. So far, they've found rhinos, three-toed horses, camels, birds and turtles. They've also found evidence that something else walked through the ashes–something big enough to prey on the dying rhinos. One paleontologist said that finding one of them would be “like Christmas”. 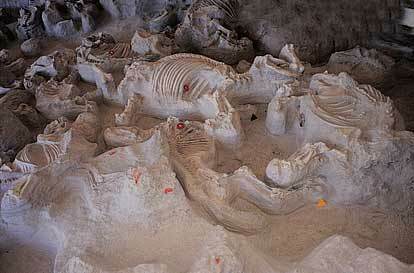 A large building called the Rhino Barn covers the excavation site. Inside, visitors use walkways suspended above the dig to watch scientists work and ask questions. Ashfall is 6 miles north of U.S. Highway 20 between Royal and Orchard. There's a small interpretive center that charges a modest admission fee. Hours vary by season, so call 1-402/893-2000 before visiting.